You obviously care about your oral health or you wouldn’t have spent the money to get dental implants. But, do you really care about making them last? You should, which is why lighting up that cigarette isn’t such a good idea. You may not think your bad habit could possibly do any damage to your new dental implant, but you’re wrong. It can, in fact, make it fail! Find out why it’s important to kick the habit in order to maintain a healthy, beautiful smile. If your dentist has recommended you for dental implants, you can expect a tooth that fits in seamlessly with the rest of your mouth. The implant is made of a titanium post and will serve as the tooth root. It is surgically placed beneath the gum line, into the jawbone. Your dentist will then place a customized tooth replacement on top of the implant. Unlike other restorations that can come loose, you can rest assured that your implant will remain in place. How Can Smoking Cause Them to Fail? Since implants are surgically placed, it will take some time for your mouth to heal from the procedure. If you are a smoker, you are at greater risk for infection and may heal more slowly. 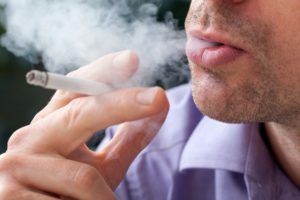 Here are just a few ways smoking can lead to dental implant failure. Reduced blood flow. Nicotine reduces the amount of blood flow in your body. For your mouth to heal effectively and in a timely manner, you need blood flowing to the wounded area. Without it, osseointegration can occur, which prevents the implant from fusing to the jawbone and results in failure. Damaged saliva glands. If you want to keep bacteria from growing around your implant, you need saliva to help wash it away. Smoking can damage the glands and cause you to have dry mouth. Bone loss. Should you lack enough saliva to keep bacteria from forming, you could develop gingivitis or periodontal disease, which can result in bone loss and ultimately, implant failure. What Can I Do to Make Them Last? Quit smoking! We all know how damaging it can be, and we know you want to keep your smile looking sharp, so don’t be surprised if your dentist doesn’t strongly suggest that you kick the habit. Regularly brush and floss. Once your implant is in place, make sure you are continuing to brush your teeth twice a day for two minutes and floss at least once a day. Avoid hard foods. It can be tempting to grab that hard candy or cup of ice, but these items can cause damage to not only your dental implant but also your natural tooth. Visit the dentist. Just because you’ve got this new hardware doesn’t mean you can skip out on regular dental checkups. Stick to the recommended six-month visits to ensure everything is looking strong and healthy. You should know that many dentists will not recommend dental implants to someone who is a heavy smoker. If you want a smile that will last for decades, you can achieve it with dental implants. Make the decision to quit smoking today. Your body and smile will thank you for it. Horsham Dental Elements has been providing the Philadelphia area with quality dental services for more than 20 years! Offering general, restorative, and cosmetic dentistry, our team of experts can handle full-mouth reconstructions, dental implants, and root canals. If you’re looking to improve your smile, contact us at (215) 672-6666 or visit our website.